Flight 828 took off from Jamaica in 2013 with clear skies, but it never landed. Thought to have disappeared forever, the plane arrives five and a half years later in New York City in 2018. No one on board the plane has aged a day, and they didn’t even know they were missing. Did they accidently travel through time? Or is there something more sinister at play? Manifest is a new TV show on NBC created by Jeff Rake. It can be seen on Monday nights from 10:00-11:00, and all twelve current episodes can be viewed for free anytime on the NBC app and website. 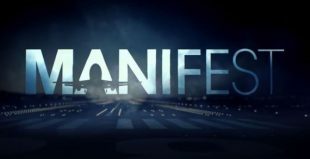 Manifest focuses on the passengers of flight 828 as they try to re-establish their lives in a world that thought they were dead and had moved on without them. The true mystery of this show appears as the characters begin to experience unexplained, supernatural side effects of their flight. They’re hounded by government figures and scientists who want to inspect them for anomalies, and stalked by religious fanatics who want to praise them as miracles. Michaela, Ben, and Cal Stone return to their family seeking solace, only to find that their families have moved on. The family dynamics of Manifest is where the show truly shines. You become hooked on the drama and emotions that intertwine the Stone family. Michaela (played passionately by Melissa Roxburgh) wonders why her fiancé and mother haven’t visited her, and Ben (played by Josh Dallas) is an intense character who struggles to understand why he can’t just jump back into the same relationship he had with his wife. Tragedies befall these couples that will break your heart, and the show makes you feel sympathy for everyone involved; no one is seen as a villain, just another victim. Ten year old Cal is a creative kid with cancer (played adorably by Jack Messina), and you really feel his pain and confusion as he realizes that his twin sister, Olive, is now fifteen, and all of his friends are in high school. Cal and Olive’s path to reconnect and figure out how they’re still twins despite their age difference is adorable and heart warming. The grief and heartbreak of the Stone family calls out to every viewer who’s ever experienced divorce, a break up, illness, death, and more. It keeps you engaged with the characters, hoping to see how their personal conflicts resolve. Manifest established itself early on as a show known for its heart wrenching emotions and twisted connections, and this is what has made me watch every episode. Yet its plot has slowly become less engaging, boggled down by its confusing mystery and steering away from its previous theme of fate. The show quickly changes from a supernatural drama centered on the idea of miracles and a higher power to a complicated science fiction-esque story with shady and cliche government figures. In addition, how the characters unravel the mystery has become increasingly frustrating. Accurate assumptions are made from little to no evidence, doors are unlocked, alarm systems non existent. Nobody questions anything, and Ben suddenly finds himself with the skill set needed to hack computers and conduct sophisticated espionage. These scenes have become boring, unrealistic, and far too frequent. With the increasing number of plot holes, I encourage Manifest’s writers to refocus the show. I think they need to rework the practicalities of the plot into something realistic, and recenter the show on its emotional and mystical aspects, because that’s what makes Manifest a riveting show worth watching. On a positive note, in Manifest’s most recent episode a new plot twist was thrown in at the end. A character with a shockingly similar and strange story was introduced, creating a whole new, fascinating mystery that encourages the viewer to watch the next episode.